After programming the ESP32 using ESP-IDF, João noticed that debug for Arduino IDE needed some improvement. 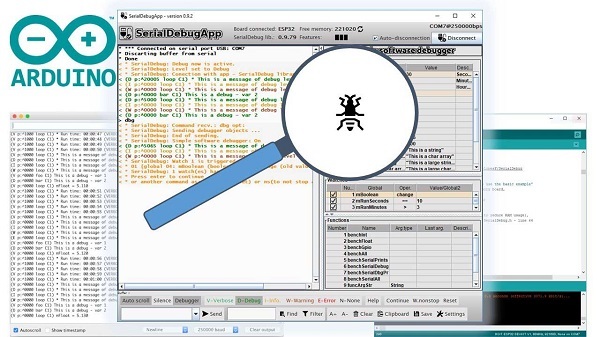 So, he created the SerialDebug library to bring better debugging to Arduino IDE. He also created a desktop application called SerialDebugApp that adds a UI and other useful functionalities. See the full post on the Random Nerd Tutorials blog and the library GitHub repository here. This entry was posted on Wednesday, November 21st, 2018 at 11:31 pm	and is filed under library, tutorials. You can follow any responses to this entry through the RSS 2.0 feed. You can skip to the end and leave a response. Pinging is currently not allowed.